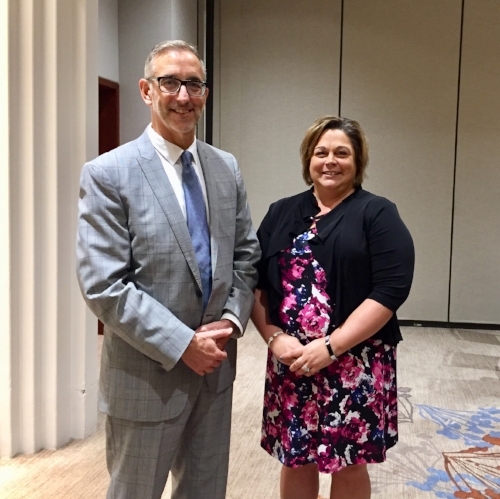 Misty Crosby, Executive Director of the Buckeye Hills Regional Council in Marietta, Ohio was elected as Second Vice President of the National Association of Development Organizations (NADO) on October 16th, 2018 at NADO’s Annual Business Meeting. The meeting was held in conjunction with the association’s Annual Training Conference in Charlotte, North Carolina. “I'm looking forward to serving with my fellow Executive Committee members to ensure the strengths and capabilities of Regional Development Organizations are top of mind with federal policy makers and funders,” shared Crosby. As Second Vice President, she will work with the NADO Board of Directors to oversee the association’s budget and operations, as well as develop policy on issues affecting regional development organizations. Starting with Buckeye Hills in 1990, Crosby was appointed to her current position as Executive Director in 2007 after 17 years of service. Today, she carries a total of 28 years dedicated to growth in southeast Ohio and has increased the profile of the agency with member counties, elected officials, and community partners. “As an economically and geographically challenged region, it is critical that Misty Crosby projects positive national exposure to Southeast Ohio. Our member counties are very proud of her appointment and have faith that she will continue using her unique abilities and her constant alertness to opportunities for the betterment of Appalachian Ohio,” shared Ron Moore, Board President of Buckeye Hills Regional Council. Crosby will serve as Second Vice President of the association through October 22nd, 2019.